So, if you are lactose challenged and you love ice cream (like I love ice cream) then something is totally missing in your life! Maybe I should start from the beginning...I apparently was lactose intolerant as an infant. I was put on soy formula at the time. From what I have read (and there has been plenty of reading now) you kind of out grow it during childhood and then it can come back later on. I have never been one to love milk. In fact, I hardly drank the stuff. Now ice cream...that is a different story! I eventually grew in to loving frozen yogurt more so than ice cream. I am not a huge sweet addict. I think that is why I kinda went more in to the way of liking frozen yogurt. I used to eat it every night(with a scoop of Kashi Go Lean Crunch and some raisins)! Those times came to an abrupt end for me. 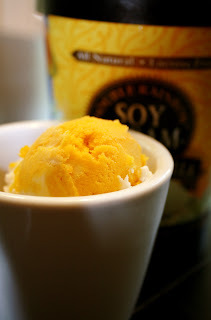 At the time, I did not really know that much about soy or rice based frozen desserts. Why would I? They are more expensive and not as easy to find. I will not lie to you, they do taste different. Anybody that tells you different is not only trying to convince themselves, but you too! I know enough about food to know that you can not replace one thing with another and claim that it taste the same. I can't stand it when people say that a veggie/soy burger tastes like meat. If you are eating a veggie/soy buger why would you want it to taste like meat??? Anyway, my point is that I have started tasting some products and at first I thought they would taste just like ice cream/frozen yogurt. Now that I understand that they don't (won't) I have a different appreciation for them. They are in and of themselves! So, the illustrator and I went to Trader Joe's yesterday for the first time. I really enjoyed it and I went for the sole purpose of finding some new dairy free foods. 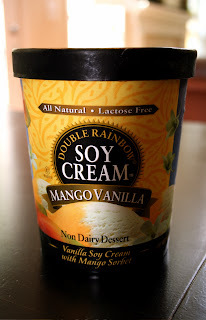 I came across a new flavor (for me) of Double Rainbow Soy Cream. Mango Vanilla...need I say more. Well, mango is so up my alley and I am always and forever a vanilla girl! I loved it. It is smooth and tart and not too sweet. On the sweet subject, I have found that a lot of different brands make their products sweeter to cover up the taste. Like I said before, I am not a huge sweet fan. Don't get me wrong, I like sweet, but I like a more natural sweetness than something that tastes like you are eating sugar packets. I like that it is all natural and I would highly recommend it to anyone (even the non-lactose challenged)!